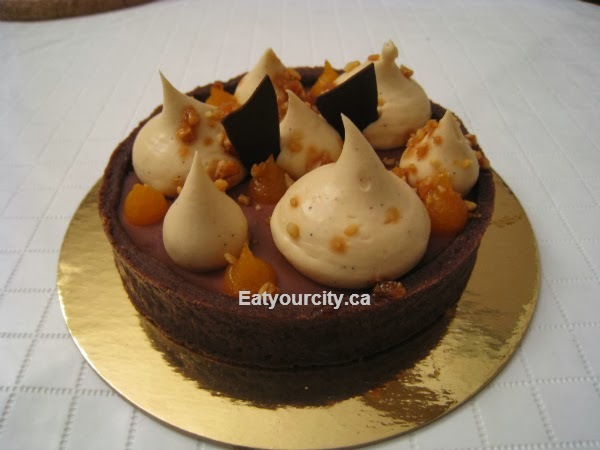 Eat Your City: The Duchess Bake Shop - a year of pastries, tarts, pies, cakes, crossaints and desserts in review! The Duchess Bake Shop - a year of pastries, tarts, pies, cakes, crossaints and desserts in review! Gigantic oversized macaron "cake"? I've always forgotten to ask what the proper name for this confection, but its essentially a huge macaron the size of a cake with plentiful buttercream sandwiched in the center, and more tasty butter cream swirled along with pretty little edible decorations in the center of the "macaron cake". I've also never figured out how on earth to cut the thing without the macaron "shell" cracking.. ah well, maybe we were supposed to eat it like a big gigantic macaron... nom! I think the first one I had was the L'Amour Macaron (think it came out during Valentines Day) with rose ganache filled raspberries encasing lychee buttercream and raspberry pepin. The rose flavoring was a bit too powerful, overwhelming the more delicate lychee flavors and the raspberry tartness helping to offset the sweetness... still a beautiful huge macaron! This one I forgetten its name, but I'm pretty sure it had a nice silky smooth chocolate hazelnut buttercream... but regardless, it was fabulous! Sour creme cherry pie - when they intially started producing pies, the crusts were light, flakey and loaded up with plenty of fruit. Maybe it was the Christmas rush, but even though it was only the time it took to drive home, the lattice was decidely on the wet and soggy side of things, and other friends who never had that problem in the past had it happen to thier pies around Christmas time too! Duchess.. pull up dem socks!! Countless macarons - with a paper thin crust, and light as air texture, these little almond flour based delicate meringue disks flank a good piped layer of buttercream... I've had all thier original flavors when they first opened, and now, there's too many flavors to count with 3 monthly rotating flavors amongst the classic flavors. Favs are handsdown still the salted caramel, the new passionfruit chocolate (debuted Spring 2013) and Valrhona milk chocolate macarons.. mmmm! St. Honoré cake This was some cream puffs filled with Earl Grey chiboust cream (light subtle taste is almost masked by the hard tasty caramel topping the cream puffs). Royal Blueberry Tart (debut Jan 2013) I was looking forward to this one as I loooove blueberries. Almond frangipane (think super fluffy airy almost cheesecake like), blackberry/blueberry compote with fresh blueberries, almond cream, blackberry glaze with cassis and caramelized hazelnuts and walnuts. Gruyere Cheese Crossaint - One of my favs - a super buttery crossaint with a bit of the rich swiss gruyere cheese inside and out, its a ridiculously savory bite of heaven. It was around when they first opened, then disappeared for a while, and was brought back by popular request in Feb 2013. Lately, its been less buttery, less cheesy and seems like the batches spend more time in the oven (overbrowned, greater overcooked cheese and just shy of burnt taste).. they're still tasty, but if they changed the recipe, there's far more than just little old me that's looking forward to them going back to the original fantasmic crossaint! Mini bags of meringues... 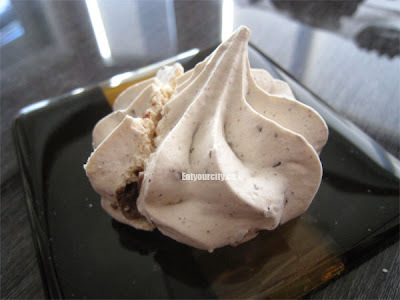 I used to avoid meringues as they always tended to be chewy, hard, stale or bland. Then my girlfriend dropped me off a bag to try... The cookies and creme ones were sooooo damn good!! Don't be surprised to see these light as a cloud meringues delicately flavored (there's monthly flavors too) disappear like magic. 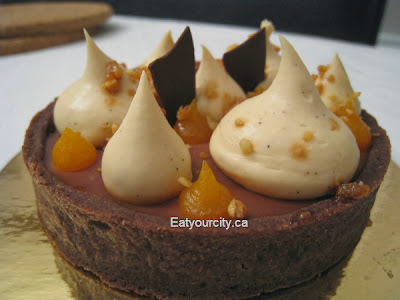 This Tarte Montréal with milk chocolate maple bourbon ganache, spiced caramel cream, apricot compote and candied almonds is several bites of wow. We bought the bigger version (no pic) as well as the little tart. 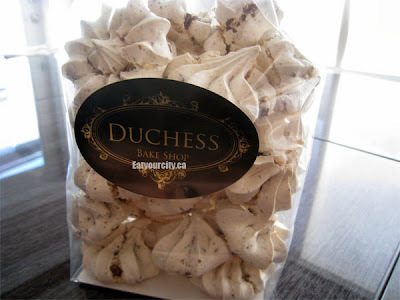 There's lots more we've tried and still more to try, but we'll let you do the tasting and exploring at the Duchess!